Securing a business loan with collateral puts lenders at less of a risk, making more favorable terms for your loan. A secured business loan (or business collateral loan) is a loan secured by your business-related assets, such as bank accounts, real estate, or equipment. 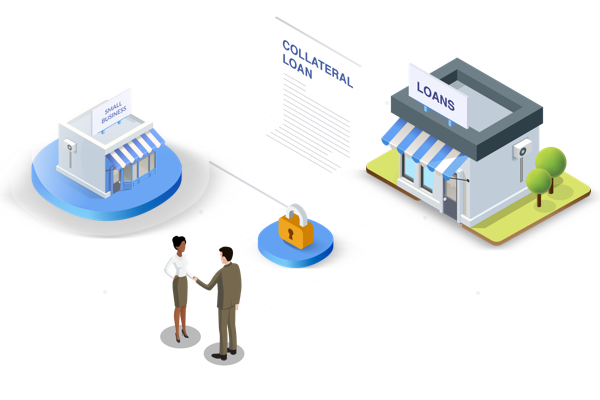 Business collateral loans come in a large variety, ranging anywhere between $5,000 - 5 million in size, and anywhere from 1 month - 25 years in length. They’re known for their low interest rates and credit requirements, making them attractive and accessible. They can also be risky, however, since it’s your business that’s on the line. If you’re thinking of taking one out, it’s important to make sure to have a solid plan for how to pay it off. Business collateral loans are usually used to grow or develop or your business. For example, if you own a successful business, which promises to continue generating income (guaranteeing your ability to pay off a loan), you can use it as collateral to take out a loan to improve it, by financing renovations, new equipment, etc. Many different kinds of loans can be collateralized by your business, like business equity loans, term loans, equipment loans, or a business line of credit. Exactly how much you’ll pay in interest depends on the kind of business collateral loan you take out. In general, however, since these loans are secured by your business-related assets, lenders are at less of a risk and will usually set interest rates quite low, even if your credit score isn’t great. Like with interest rates, the guarantee of collateral means that business collateral loans often have low credit requirements. A thriving business will have valuable assets, meaning lenders won’t be too concerned with your credit rating. Depending on the loan amount, you can potentially get approved with a rating as low as 500. As long as your business has valuable collateral securing your loan, you should be able to get a business collateral loan even with bad credit. That said, the better your credit, the lower a lender will set your interest rates. And in general, it’s not recommended you take out a business collateral loan unless you’re sure can afford the payments, since a default can mean damaging or even losing your business. Business collateral loans can be used to get your small business off the ground, or even start a new one. For instance, you can take out a loan to buy the real estate or equipment you need to get your business going, on the agreement that the lender will seize the asset itself if you find yourself unable to pay it off. Popular startup-friendly loans are SBA Microloans, good for amounts less than $50,000, or SBA 504 loans, typically used to finance fixed assets (land, buildings, equipment, etc.). Collateralized loans provide lenders with extra security, meaning better terms for you and easier approval. The downside is that the risk is higher for you as well, and you could potentially lose your business if you can’t make the payments. With a non-secured loan, you’ll pay higher rates, and require a better credit rating to get approved, but if you can afford it, this may be the safer option, since you don’t risk damaging all the work you’ve put into your business.